The specifications of Samsung ML-1915 printer, with important information about it as paper, printing speed and connectivity. 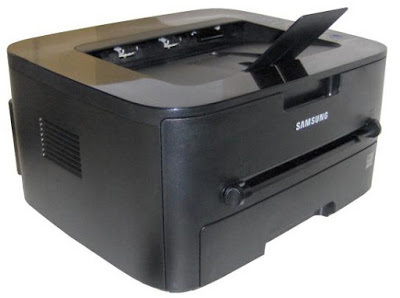 The Samsung ML-1815 printer is the type of monochrome printers which gives the possibility to locate anywhere in our home or office, this printer can be obtained pages of good quality and performance of the best consumable based on the cost per page that is handled today with any monochrome printer. This printer unlike the above has a bulge in the back of the printer that enables this process lighter and faster printing, this bulge is not allowed to see from the front of the printer. This printer as much of monochrome printers Samsung has the capacity of 250 pages in the input tray located on the bottom front of the printer. The only type of connection for this printer is USB 2.0 port with which account. Cylinder has a separate toner cartridge that allows to better slide into the printer paper for better print quality, the printer is compatible with Windows, Mac OS X and some versions of Linux. The speed of this machine is 18 pages per minute for the first lasting about 10 seconds preparing to print, it is a good time to normal from other monochrome printers even from the same manufacturer. You can print sizes A4, A5, A6, ISO B5, JIS B5, executive, letter, legal, folio, legal, custom and output capacity (upper tray) 80 pages normal guy roles. This team does not bring USB cable included, with a dimension of 360 x 389 x 197 mm and a weight of 7.25 kg. Toner cartridge for this printer has a yield of 1,500 pages and you have another that could be called XL version that prints about 2,500 pages. (MLT-D105S) / (MLT-D105L) respectively.